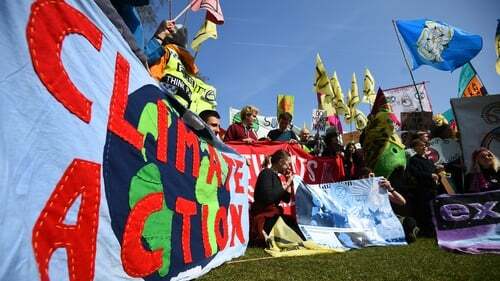 The group says it plans to continue throughout the week and wants to "bring London to a standstill" until the government takes "urgent action to tackle climate change". Rowan McLaughlin, 47, a teacher, said this week's protests were more important that the huge pro and anti-Brexit protests in London recently. "We have to go on to a war footing". The scientist said the group was calling on the United Kingdom government to fulfil three demands: to better inform the public about climate change, to make the country carbon neutral by 2025 and to create a citizens assembly model on environmental issues. "We wish to make peace with ourselves by making peace with our neighbour Earth and with our God", he said. They plan to engage in acts of non-violent civil disobedience against governments in capital cities around the world. Police had asked the campaigners to restrict their protest to Marble Arch after they caused widespread disruption on Monday, the BBC reported. "There have been 113 arrests in total, the majority of which are for breach of Section 14 Notice of the Public Order Act 1986 and obstruction of the highway", police said. It could be there are more arrests at night and people are ready and willing. A police officer on the bridge said the Met could impose limits on assembly if they felt there was a serious risk of disruption or to public order.